This article attempts to assess the value of the part of the Greyton Commonage that TWKM intends to sell. The prospectus says that no municipal general valuation could be obtained, and confirms that a fair market valuation must be used. The benefits to each party involved are outlined. The valuation of R 4,329,850 is stated to be the ‘market-related price’. This was said at the open meeting on 3 March’16 and will be ring-fenced. The valuation of such a large area (235 ha) seems to be grossly under-estimated. 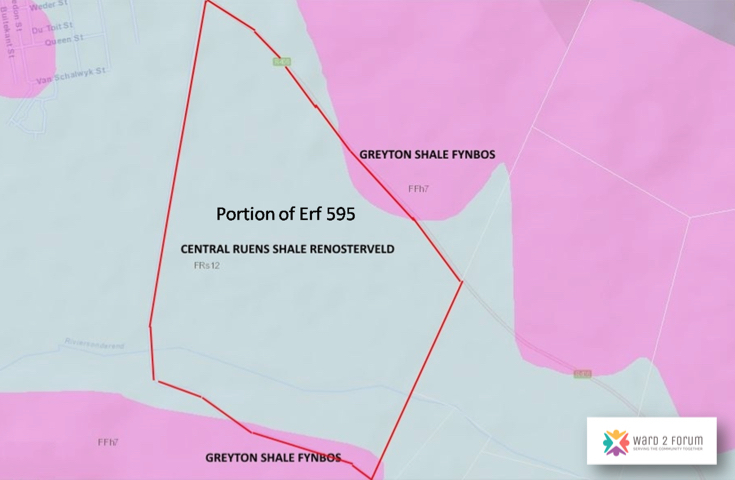 The Valuation roll of July 2014 has an entry for Erf 595 of R 8.34 m, although the Erf area is only shown as 14.2 ha (data for previous years shows similar figures). The area is obviously incorrect, but is the value thus also incorrect? This valuation must be challenged. The prospectus implies that municipal rates will be R 0.25 m per annum, based on the value of the farm. However, until the farm becomes fully operational, the rateable value will be nearer to the purchase price, producing under R 9000 rates per annum. The initial cost should therefore reflect this long term value, rather than the arbitrary value agreed by TWKM. The alienation would also remove any responsibility for TWKM to formulate any plan for the management of the land. It has been assumed that all bulk services will be funded by the purchaser. This is not actually stated in the prospectus, and in any case has not been detailed. Although TWKM state that they will benefit from the service charges, this may not be the case because some services, for example potable water, are already inadequate and will require considerable capital investment to provide in the future. The project as it is will certainly provide some business opportunities for Ward 2, but they would seem to be marginal, although any sustainable employment has to be a benefit. There is unlikely to be any positive effect on Tourism; if the traffic impact, dust and noise become significant, the effect will be harmful. The TWKM prospectus claims that a capital investment of approximately R 80 m will be required to develop a viable business. There is no breakdown of this figure to indicate how much expenditure will be on land clearance and preparation, buildings and infrastructure, and equipment. Expectations of significant local business expenditure are not considered to be realistic. Development of this project will not benefit Greyton, other than by some additional albeit unquantifiable local employment. There will be environmental impacts, the permanent loss of some natural vegetation, the permanent loss of grazing land for small farmers, the loss of amenity value for those who bike, walk, ride horses, collect firewood etc. Intense agricultural activities will be much closer than before to the residential areas of Greyton. Please note that this series of articles is aimed at giving an unbiased view, based on the points of view expressed by all the relevant parties and the collection of information related to the alienation of the Greyton Commonage. The series will culminate in a final document that will incorporate a full & comprehensive proposal that should address the expectations of all involved but with the prime objective of ensuring we as a community foster Rural Development in a viable and sustainable manner that would benefit all. As owners of 1 von Solm Str, my partner and I feel that no thought has been expressed about the actual impact on the ? 5 erven at the start of von Solm street. As such being on the eastern side of the Gobos River we will bear the full brunt of the aesthetic changes this sale will bring about. We are the barrier to the changes that will affect Greyton town. What consideration is or have been given to the impact this proposed sale will have on the quality of our lives(spraying of crops, pollution of air through dust, noise ) the value of our properties.the safety factor due to increased foot tragic in the area? Can some attention kindly be directed to our situation as well.